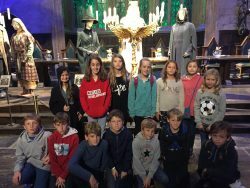 On the first day of the half term, Mrs Schutte, Miss Brown and 14 excited Middle School pupils went to the Harry Potter Warner Bros. Studio Tour in London for a day of wizardry, special effects and fun. As we pulled up in the mini-bus, we were greeted by our own Tour Guide, who spirited us through security and into the magic auditorium. We then started our walking tour, which took us behind-the-scenes to a huge array of beautiful sets, costumes and props. We also learnt about the special effects and animatronics which made these films so hugely popular all over the world. 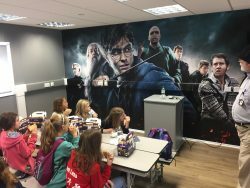 Our lunch was provided in Harry Potter lunch boxes in our own private dining room. Here we were joined by a guide who had worked on the actual films! He told us lots of secrets about what really went on when the cameras stopped rolling. We then continued our tour, along the famous cobbles of Diagon Alley, where Tega tried to ‘high five’ a Death Eater (with limited success). 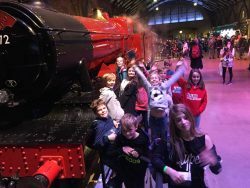 Highlights were undoubtedly being in the Great Hall, catching the train on Platform 9 ¾, exploring Dumbledore’s office, seeing Hagrid’s motorcycle and having lunch with the Death Eaters! What a fantastic start to the Michaelmas Half Term. Many thanks to Mrs Schutte and Miss Brown for taking us!